The Term "European hinge" collectively refers to self closing, concealed cup hinges. These hinges are found on almost all cabinets, be it in the old world or new. The hinge itself is completely concealed by the cabinet door when the door is closed. Installation requires a cup, a shallow 35mm hole, to be drilled into the cabinet door. The head of the hinge fits snuggly into this cup creating a bond that is much stronger than screws alone can provide. The hinge snaps into a bracket installed on the cabinet carcass. The hinges and brackets are sold separately. This is done because a hinge can be used with many different brackets; and vice-versa. Opening arc: Almost all hinges will open to at least 90 degrees. Some swing beyond 180 degrees. Different applications call for different hinges. In a kitchen a 180 degree hinge would cause the doors to hit the cabinet next to it. a 120 degree hinge is the appropriate choice. More is not always better. Overal vs. non-overlay: Doors can be installed either as an overlay door (the door is wider than the opening and overlaps the faceframe) or as an inset door (the door is smaller than the opening). When purchasing the hinge select a type that fits your door style. Adjustable vs. fixed: One of the advantages of European hinges is the ability to adjust the fit of the door in as many as 3 directions. Not all hinges offer this feature. Hinges built for mass production do not require to be adjusted. The precision of today's CNC enabled cabinet shops is near perfect. For one-off work fully adjustable hinges are recommended. Both types function is identical. Adjustability just costs a few cents more per hinge. Bracket size and type: Brackets determine how the hinge is connected to the carcass. At the basic level the brackets come in faceframe versions (attach to the faceframe) and cabinet versions (attach to the cabinet directly). Within each category there are different sizes that create different reveals and install options. There is no substitute to reading and understanding the manufacturer's specifications for the bracket and hinge you are installing. The two have to match and fit your cabinet. Installation begins with drilling the cup in the door with a forstner bit. The cup's walls need to be perfectly perpendicular to the door's face. Otherwise the door will not close properly. 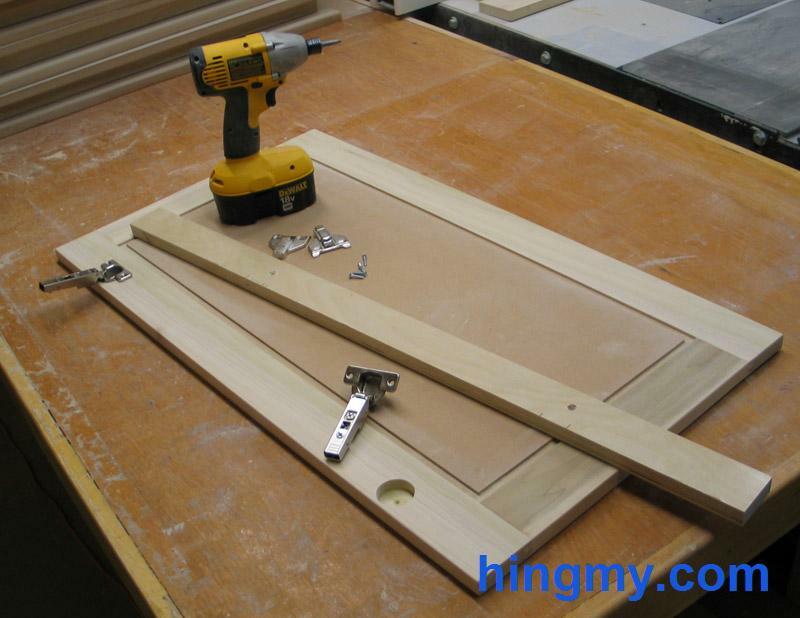 A drill press or special jig is required to complete this operation. A hand drill will not do. The location of the hole depends on what type of hinge is being installed. Consult the manual that comes with the hinge or the manufacturer's website. The important measurement to get right is the distance of the cup to the edge of the door. This will determine the reveal of the door. All hinge cups must be located at the same distance from the door's edge. Otherwise the door will bind. If you do not have a 35mm forstner bit, a 1 3/8" bit (34.92mm) will also do. Most hinges will fit just fine. Once all cups on the door are drilled, insert the hinges. The hinges need to be installed perfectly perpendicular to the door's face for the door to close properly. This is much easier to do than it sound at first. Push a straight edge or scrap piece of lumber against the square side of both hinges. Spin each hinge in its hole until there is no gap between it and the straight edge. Once that is done, the hinges are installed perpendicular to the door face. The location of the cups and the geometry of the hinges themselves cause this to happen. Drill pilot holes and attach each hinge with two screws. Measure and install the brackets: If you are confident your cabinet and door are built to spec with less than 1/32" of error, measure and install the brackets. Clip the brackets to the door and install: On a one-off cabinet that was not batch-built it is often easier to install the hinges and the door at the same time. Clamp a straight piece of lumber to the bottom of the cabinet at the overlay line of the door. 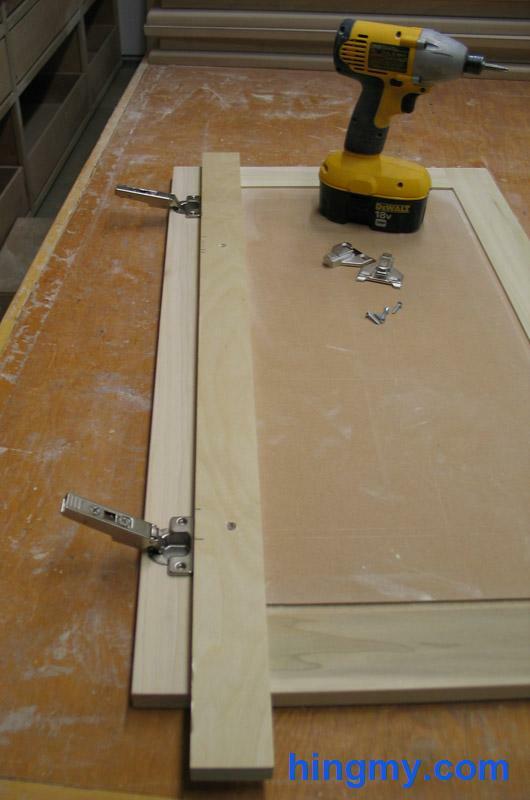 For example, if the door is to have a 1/2" overlay, clamp the piece of wood 1/2" below the top edge of the bottom frame. Rest the door on the piece of lumber, align the hinges with the door half open, and attach the door. If the hinges you chose are adjustable, use a screw driver to adjust the fit of the door. Adjustable hinges offer 1/4" to 1/2" of play. This is usually enough to compensate for mistakes made during carcass and door construction. European hinges create the look and feel everyone looks for in cabinet doors. They are widely available at very good prices. European cabinet hinges and cabinet building go hand in hand.